By the time The Wing opened its doors in 2016 in the historic district of Manhattan’s Ladies’ Mile, people were clamoring to get in. 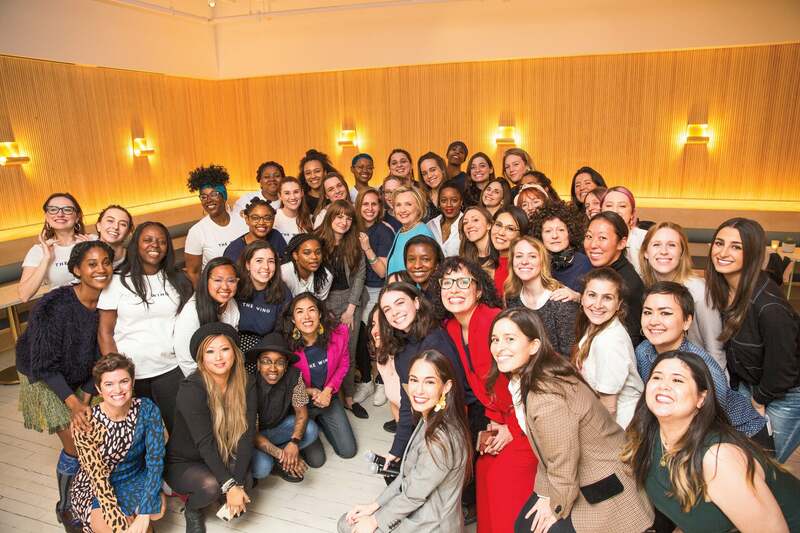 The all-women coworking space attracted young professionals who were eager to spend their days alongside like-minded women, despite annual member fees of $2,350 and a very long waitlist. It’s not hard to see why: The stylishly designed space boasts amenities like showers, beauty rooms, lactation rooms and private phone booths; and the regular nighttime event series has included panels with everyone from Jennifer Lawrence to Hillary Clinton. This hasn’t come without some controversy. The New York City Commission on Human Rights launched an inquiry this spring to explore potential violations of anti-discrimination laws -- essentially questioning whether it’s legal for The Wing to shut out men. Founders Audrey Gelman and Lauren Kassan, however, have expressed confidence that they’re in compliance with the law. And they’ve continued an aggressive expansion, recently announcing plans to grow from four locations to 10. We talked with Gelman about challenges faced as a female founder, the necessity of safe spaces for women, and how The Wing has become a veritable startup factory. The Commission on Human Rights inquiry surprised many of your members, though I imagine you’ve anticipated these kinds of concerns and critiques. How do you go about preparing to defend why there’s a need for spaces like The Wing? Unfortunately, the news and current events have done a lot of that work for us. It’s plainly evident to anyone who is not living under a rock -- and certainly to anyone who moves through the world as a woman and experiences the kind of discrimination and harassment we’ve learned to absorb on a daily basis -- that it’s important to have spaces like these. The amount of support The Wing receives on social media from members, nonmembers and celebrities seems to back you up on that. We’ve been blown away since day one. The support from members and allies and women who don’t even live in the U.S., to come out and say that they stand with us and support us and ask us to bring The Wing to their city, it’s been really humbling and encouraging. There’s a lot of news right now that’s left women feeling disillusioned. But to see women coming together and fighting back and organizing -- whether through the Women’s March or in support of organizations like The Wing -- that’s the silver lining to all of this. You’ve raised almost $43 million in capital, something that’s notoriously difficult for both female-founded companies and female-­focused companies. What was it like getting investors to understand this vision? Very difficult at first. We were told by a lot of investors that women would just never want this. I think just because it was unprecedented in a way. And we told investors that actually, it’s not unprecedented; there were hundreds, even thousands, of these women’s clubs that existed a century ago, and they were a big inspiration behind The Wing. But just because it didn’t exist, it was hard for investors to believe it was a good idea. Of course, there were other investors who thought, Wow. Precisely because this hasn’t existed is why it is so visionary. So they got it and believed in it. It can take a really long time, but you end up finding and pattern-matching with the right people. You have three locations in New York and one in D.C., and plan to open in Seattle, San Francisco, Los Angeles, Toronto and London, as well as Brooklyn’s Williamsburg neighborhood. How do you select cities for expansion? We have information about traffic to our website and followers on social media. Those insights let us know where we’re already on people’s radars. But it can be overwhelming. We Instagrammed the other day, asking followers where they wanted to see the next Wing, and there were almost 2,000 responses. And it was like, Provo, Utah; and Nairobi; and Latvia. So we’re hard at work to respond to the demand and be able to grow the community. How much do you cater to the specific needs of each city? There are certain elements that will always be consistent as we scale -- design, amenities -- but a lot of our programming is really driven by what the local community wants. And you’d be surprised -- in D.C., for example, we do have a lot of political programming, but many of our members there live and breathe politics every day, and they’re really interested in, like, learning how to plant their own garden, or doing Reiki, things they may not have much access to culturally. We take a bottom-­­up approach rather than top-down. It’s about listening and having a community team that is open to feedback and implements it quickly. A lot of your members are entrepreneurs or budding entrepreneurs. How has that impacted your community? A number of our members have quit their jobs after joining because they’ve found the confidence to take professional risks. Having a community that has your back -- even if you don’t know every single person’s name -- gives women the courage to take leaps. We’ve had members start companies together. We’ve seen lawyers leave their white-shoe law firms and start their own firms together, and then they represent other women at The Wing. We’ve seen women who’ve been able to raise their seed round through investors or relationships they’ve made through our community. How do they connect when they’re not in the physical space? We have a digital member directory, and we’re in the process of building a mobile app that will launch for members this summer. The directory has really high engagement, women who are searching for each other. They’re searching for graphic designers or lawyers or communications professionals, and they’re getting in touch and hiring each other through that digital network. Is a digital-only membership something in The Wing’s future? We’re looking at it closely. You know, again, to the point of the requests we get from places like Nairobi and Latvia, I think it would be amazing. Figuring out how to give digital access to the rich programming and networking opportunities we provide is something we’re doing a lot of hard work on right now. How often do you hear requests from your members? We are constantly surveying and hearing ways we can make The Wing more valuable. We heard, for example, that they wanted more coffee, so we just made all drip coffee free for members and guests. We’ve been able to take our food and beverage offerings to the next level, working with members to find out more about what they want to eat. Some members request more private phone booths. Some simply request having more Advil and tampons in the bathroom. We try to move quickly to accommodate as many requests as we can, large or small. We’re a new, young business, so we’re hungry for feedback. Have you noticed any patterns about how and when women use The Wing? Do they plug in from 9 to 5, or are they coming and going more than you expected? It’s used very flexibly, and I think that’s what really works. There are a lot of businesses, like gyms, whose business model is kind of built on this idea that you’re not going to show up. But we’re focused on getting our members to be as engaged as possible with the space.